The Endeavor baitcasting reel is one of the best, low cost reels on the market today. It has 3 stainless steel, anti rust bearings, a 1 way clutch for instant anti reversing action, and an aluminum spool that has been machined and anodized. The durable anti backlash control ensures increased overall sensitivity and greater ease while casting. 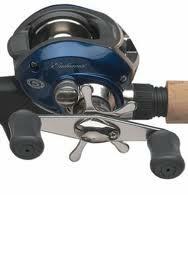 The Pflueger Endeavor Combo performs with precision and a smooth, quiet casting experience. This entry was posted on Tuesday, August 30th, 2011 at 9:32 am	and is filed under baitcasting reel, Baitcasting Reels, Fishing Equipment, Fishing Reels. You can follow any responses to this entry through the RSS 2.0 feed. You can skip to the end and leave a response. Pinging is currently not allowed.